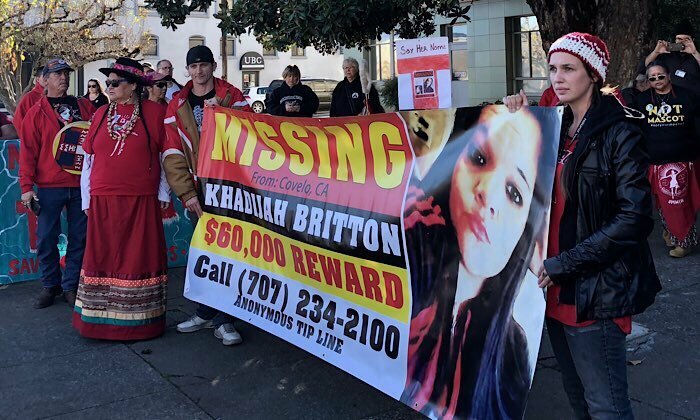 Community members highlight Khadijah Britton's disappearance at a Mendocino County Sheriff's Office press conference in December, 2018 — Kate B. Maxwell. 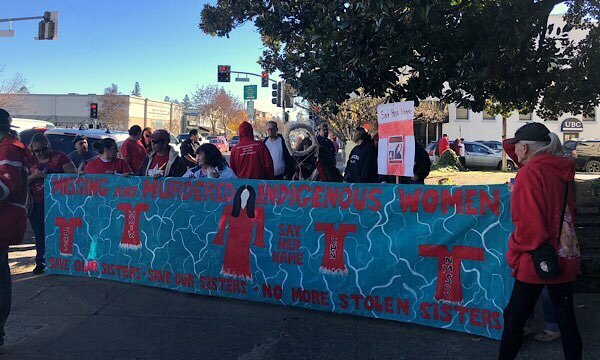 UKIAH, 12/6/18 — Local law enforcement, the Federal Bureau of Investigation and the family of Khadijah Britton held a press conference today Dec. 6, in Ukiah, to discuss the disappearance of the young woman, and urge anyone with information about what happened to her or where she might be to come forward or share that information anonymously via a new tipping service, "We Tip." There were no significant updates about the whereabouts of Britton, nor about any new evidence concerning suspects. 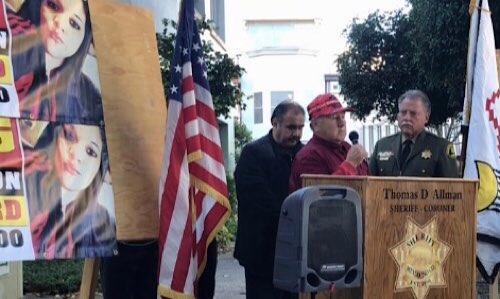 The event was held in front of the Mendocino Superior Court, with most of the presentation made by Sheriff Tom Allman, though FBI Assistant Special Agent Sid Patel, and Round Valley Tribal Chief of Police Vincent Cordova, also spoke on behalf of law enforcement, with Patel in particular detailing the role the FBI has played so far in the search. Britton's grandfather, Ronnie Hostler, also spoke, asking anyone with information to come forward. He stated that he believes his granddaughter is dead, and was murdered, but that the family deserves to know exactly what happened and what the motives of the killer were. "It's been ten months now, I want to know why my granddaughter is still missing," said Hostler during an emotional speech. The MCSO has been conducting an investigation across Northern California for ten months, but Britton has not yet been located. She was last seen in Covelo on February 7 of this year, reportedly being forced out of a house and into a car at gunpoint by her former boyfriend, Negie Fallis. This week, Fallis was sentenced to four years in state prison on a firearm possession charge, but no charges have been brought related to Britton's disappearance. Law enforcement officers and family members spoke at the conference today encouraging anyone with information to come forward. At the conference Allman also announced that the sheriff's office is now using a new contracted anonymous tip service, "We Tip," which allows for additional layers of anonymity for anyone who may have reservations about calling the sheriff's office directly. The We Tip phone number is 1-800-78-CRIME, and the Sheriff's tip line is 707-234-2100. An $85,000 reward is available for any information that leads to Britton, with another $25,000 available for information leading to a conviction. The press conference included an overview of the investigation over the last ten months, from the first days of Britton's disappearance, by Sheriff Tom Allman, who urged anyone with any information about Britton to contact law enforcement. Fallis, the primary suspect in her disappearance, was previously out on bail but is now in state prison, and Allman encouraged anyone who may have more information to come forward. Agent Patel, who works out of the FBI's San Francisco Office, said the agency had been partnering with MCSO to provide resources, expertise, and testing evidence. 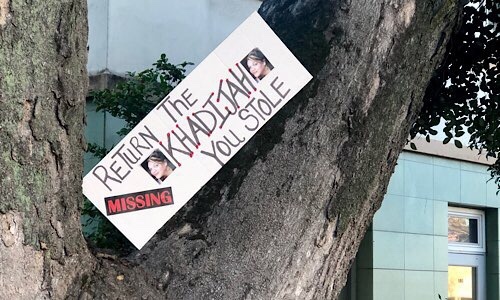 A significant reward, $85,000, is available for any information leading to finding Khadijah Britton, and Allman announced that someone had donated another $25,000 for information leading to an arrest and conviction in the case. 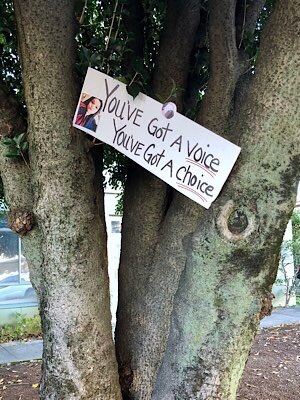 Otis Brotherton, a friend of the family, called for closure and asked people to step forward with information. 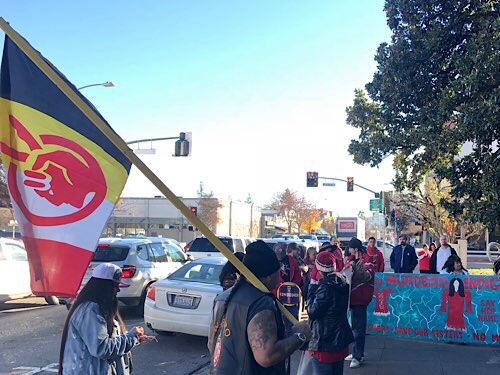 After the press conference, community members spoke about Britton's disappearance, noting that there were a number of different groups including the Missing and Murdered Indigenous Women's movement and the American Indian Movement present in support, and performed a brief ceremony. You can watch the full press conference in the video below, including the portion after the press conference. There is another video, taken on Facebook live from a different angle, of the press conference and the following comments. Our full coverage of Britton's disappearance and the legal proceedings against Fallis can be found here.